(野沢凡兆, Nozawa Bonchoo) was a Japanese poet born c.1640 in Kanazawa. 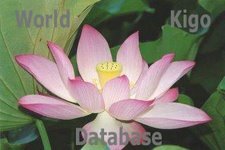 He spent most of his life in Kyoto working as a doctor. 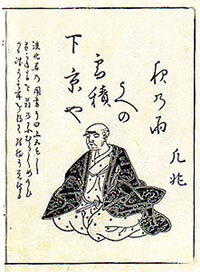 Boncho was one of Matsuo Basho's disciples and wrote many famous haiku and renku of his period. Boncho died in 1714.
the smells of things . . . In the rains of June. Miner and Odagiri say they follow the interpretation that "dampness has produced some mold on her clothes. The reason she has not worn them is that from 1682 to 1689 sumptuary laws forbade people not of the aristocracy or warrior classes to wear certain kinds of dress. Perhaps a slight critical tone here?" "This is haiku in that the wetting of the garment brings out the meaning of the rain, but the clothes were perhaps more important to her than the rain." Ukoo (d. ca. 1716-35) lay name Tome. Surname unknown. She was born in Kyoto, lived in Osaka, and married Bonchoo, taking orders as a result of ill health and perhaps for freedom of movement as a poet. In 1689 she appeared as a poet in 'Arano' ["The Uncleared Moor"--one of the seven collections ('Shichibushuu) that best represent the Basho-school of haikai]. Her care of Basho while at Kyorai's hermitage moved the master to comment in his 'Saga Nikki'. Although not the poetic equal of her husband she is one of the finest poets in 'Sarumino' and suitably appears in the 'Ume Wakana' ["Plum Blossoms and Fresh Shoots"--Ume Wakana no Maki, 1690] sequences as well as in the hokku parts. "Being weak in body and given to ill health, I thought how hard it was to tend my hair and so changed the style this spring." "On seeing illustrations of 'The Tale of Genji'." Takeda (Tome) Uko-ni -- wife of Boncho and sister of Kyorai. On a wintry, slippery night, Boncho, with his 12-year-old servant boy, was about to leave for a haikai no renga party. Uko recited this poem on the spur of the moment. Boncho, awed and ashamed, went on alone." An Anthology, ed. Faubion Bowers"
Thanks to you, I have just discovered Nozawa Boncho. So I went Googling. WOW!